Who doesn’t love sparkling tile floors with their smooth surface and shine? People love to adorn their bathrooms and kitchens with tiles. The reason tiles are such popular choice for flooring is that not only they are durable but, look appealing to the eye as well. But everything loses its luster and shine with the passage of time. The grout lines present between the tiles become dirty as they absorb water, oil, and dirt. Grout is a porous material and absorbs dirt. Scrubbing and mopping can clean the surface but not the dirt that is embedded deep in the tiles making them look dull and old. Mopping and scrubbing are the common household cleaning methods. Now, you might be able to clean your tile floor using a mop only, but a mop cannot bring shine to your tiles. For a deep cleaning that makes them sparkle, you need to have professional tile cleaning to rejuvenate your tiles. 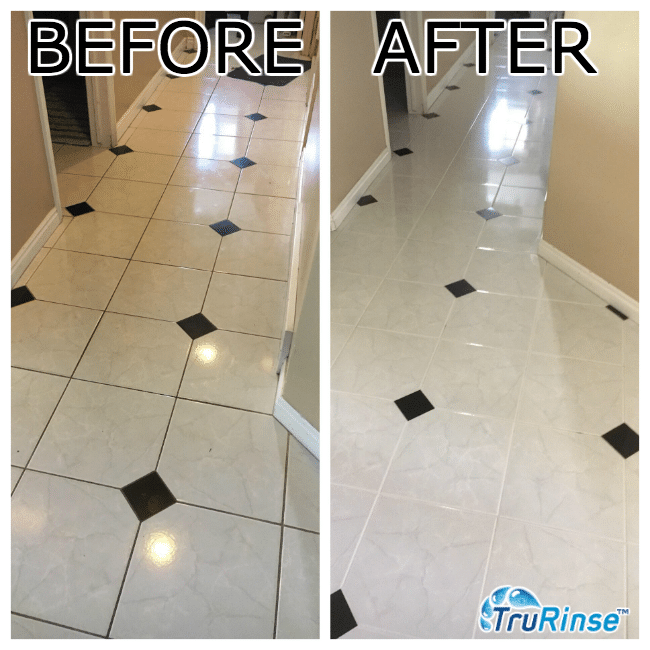 TruRinse can restore your tiles and grout to their former glory. If your tiles need that deep cleaning, you need our professional tile cleaning services. TruRinse is a Utah-based company and specializes in high-quality cleaning services. With an experience spanning over decades in the industry, We have a team of experienced professionals who religiously follow the industry standards. Using powerful extraction equipment, our team will bring you such sparkling results which your scrubbing and mopping efforts definitely cannot. If you hire us for your bringing life back into your tiles, we can ensure your tiles having a prolonged life too! No matter what your tile cleaning needs are, dirty outlines, traffic tiles areas, bathroom floor tiles, kitchen flooring or hallways, we have got you covered. We provide high-quality, efficient, and professional tile cleaning services so that your floors are clean and shine for months. TruRinse offers exceptional tiles and grout cleaning services. We use our own water and electricity for our cleaning services. Also, we use our own high risers so that whatever kind of cleaning jobs we do, we do it well whether it is for residential or commercial purposes. Our technicians are highly experienced and professionally trained to clean ceramic and porcelain tiles, grout and vinyl as well as all kinds of concrete and natural stone floors. You will be both pleased and surprised by our services when we are done cleaning your tiles and grout. Using the most effective tools, techniques, and products, we will make your tiles look as good as new. You can rest assured that you will get excellent customer service here with equally incredible end results. You can also read the reviews of our satisfied customers and know how good we are at what we do. If you think it is time that your tiles have that spotless and squeaky cleanliness, get an appointment for our professional tile and grout cleaning services. TruRinse is widely popular for its amazing variety of cleaning services throughout Utah and Salt Lake valleys. With us, you can never go wrong!